So Tahir Square Phase Two is finally under way! For Egyptians who had lived under military rulers masquerading as civilian presidents finally got the hint. That soldiers had taken them for a ride since Abdel Nasser’s days. That since the 1950s when the British departed, the three presidents they have ever known; Abdel Nasser, Anwar Sadat and Hosni Mubarak were all soldiers in civilian clothes. Now they know better. They have realized that their might as a people would defy any military might that may be ranged against them. Let us phase it. Since 1948 when the Israeli state was founded under a barrage of guns and mortar from the Arab nations, Egypt’s position as the Middle East Arab military super power was unassailable. Because of its role in championing the cause of Palestinian Arabs and power to confront Israel militarily made the rest of the Arab world to contribute resources to sustain its economy. Being a desert country with no oil to sustain its economy, it had to perpetuate the myth of its military power to continue receiving support from the Arab world as it exerted more authoritarian rule over its subjects back home. This myth had to be dispelled in the 1967 Six Day Arab Israeli war that saw Egyptian military might destroyed in less than a week. The defeat by tiny Israeli forces was so humiliating that in a matter of days Abdel Nasser, the man who had promised the world that he would wipe out Israel from the face the earth had to suddenly die. Whether he committed suicide or died of shock at this defeat, the world will never know. When Nasser died, Anwar Sadat, another military strong man had to take over the reins of power. Sadat is more famous for signing the Camp David Peace Accord between Egypt and Israel during Jimmy Carter’s presidency. This development followed another war- the 1973-74 war against Israel in which there was no clear winner. The signing of the Peace Accord with Israel in 1979 did not go well with Islamic fundamentalists in the Arab world. To them, Anwar Sadat had betrayed the Palestinian and therefore the entire Arab cause. From then on, Sadat was a marked man. Two years later, he was assassinated during a military parade in the center of Cairo. This was the event that ushered in Hosni Mubarak as the next military strong man. 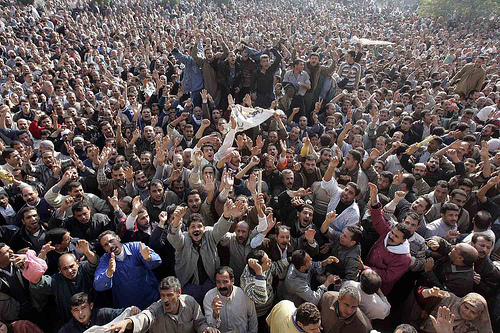 Mubarak had to rule Egypt for 30 years until he was deposed by people power during the Arab spring of 2011. The reason why the current Tahir Square riots are awake-up call for dictators in the Arab and the African world is because Egyptians tasting freedom and realizing the power of the masses are behaving like the lion that has tasted blood. If the Egyptian military thought the Tahir Square riots in spring were targeting Hosni Mubarak; they were dead wrong. If they thought that Egyptians would go to sleep and let soldiers continue with business as usual; they were gravely mistaken. Their single objective was to expand the democratic process and never again would they cow down to military might. As I wrote this article, at least 40 Egyptians had lost their lives due to military actions against civilians yet this tragic development has not cowed the protests that have now escalated to Alexandria, the Suez and other major cities in Egypt. What is happening in Egypt should be a warning to the remaining imperial, royal, civilian or military dictators wherever they may be because the world has truly changed. With events in Tunisia, Libya, Egypt and Syria taking place so soon and in quick succession; they are stark reminders that the die is cast for authoritarianism. The world can no longer tolerate kleptocratic governance styles of Pinochet of Chile, Abacha of Nigeria Mengitsu of Ethiopia, Siad Barre of Somalia and Robert Mugabe of Zimbabwe. Any dictator that still thinks it will be business as usual must think again. The Arab Spring uprising has awoken world citizens’ conscience wherever they may be. With riots going on in Greece, Italy and the United Sates over the cost of living; with poor Americans rising up against wealthy economic dictators of Wall Street; it is no longer possible for kings, queens and emperors to sleep soundly while the wretched of the earth toil and sleep under the vagaries of nature’s elements. If you want to know that the privileged are afraid; see how the wealthiest of Americans are pleading with the Obama administration to tax them more. They are doing this to avoid being targeted by Wall Street protesters, the mob that says they constitute 99% of America’s poor population against the 1% of America’s affluent society. Whichever way you look at it, dictatorship and exploitation of the masses, whether by military force or the rich and powerful amount to the same thing; eventual resistance and uprising by the oppressed people. If it can happen in New York’s Wall Street, Los Angeles, Tahir Square, Tunis and in the streets of Libya and Damascus, it can happen to us too! IN WHOSE INTEREST ARE WE AMENDING OUR CONSTITUTION THIS SOON? Finally Speaker Kenneth Marende allowed Mutula Kilonzo’ amorphous Amendment Bill in the house for debate. The Bill seeks to amend several clauses that not only deal with the Election date as stipulated in the Constitution but also how to effect the 30% rule for equitable gender representation in the two houses of Parliament. Though the controversial bill originated from the Cabinet where all party leaders represented in parliament sit, this sudden rush to give Kenya its First Amendment when the very constitution is yet to be implemented in totality has been a cause for concern among back benchers, members of the public, political analysts and observers alike. However, the zeal with which the Justice Minister is pushing this amendment with tacit support from the chairman of the Independent Elections and Boundaries Commission must be a cause for worry to those who fought day and night to have the constitution passed without amendments. If indeed these amendments are necessary now, why didn’t the Justice Minister along with others of like mind point out the loopholes during the public debate which lasted several months? More importantly, what informed the Committee of Experts’ decision to fix the date in August every year? Were they not aware that our Financial Calendar is always in July and that the current Parliament’s term would expire in December 2012? What is so sacred about the July Financial year? What would be so wrong in cutting the current parliament’s life by a few months? Isn’t this a small prize to pay for democracy to take root in this country? This amendment is beginning to give us dangerous signs and possible problems in the future. We are now beginning to realize that any time the Cabinet does not like an aspect of the Constitution, the Justice Minister will be compelled rush an amendment. Yet this is precisely what massacred the Lancaster Constitution so much that 40 years later, we were compelled to write a completely new constitution. This amendment does not auger well for Kenya. 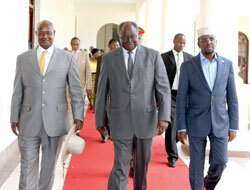 We are beginning to see the Executive encroaching on matters that are purely parliamentary. That date was set so that the Executive would have no say in when elections are held. Yet if the amendment goes through, the Executive will have done just that; controlled the parliamentary calendar- at least for now. I have not seen the bill however, I’m wondering if this amendment is specific to 2012elections or it will be a permanent feature since the 11th Parliament will also resist cutting short its life. Before we voted for the constitution in August last year, we were repeatedly told that nobody had the power to alter, delete or remove even a coma from the sacred document. What has happed 14 months later? When MPs brought in 250 amendments before the referendum, all of them were defeated. Where will Justice Minister get the two thirds majority to pass this bill? Is he ready to buy MPs to get this thing passed? At the time the Speaker was allowing this Bill for debate, a matter in court concerning the same had been mentioned in the Supreme Court that subsequently referred it to a lower court for hearing. Are we saying that Parliament has no respect for a matter that is already before the courts? Where is the separation of powers here? By succumbing to pressure from the Executive, the Speaker of the National Assembly has surrendered his powers to the Executive. He should have waited to see how the courts would rule on the matter. Saying that the courts’ role in this issue is merely to interpret the law is mischievous. This kind of statement is obviously misleading and unfortunate coming from those who are expected to know better. In my understanding, courts are there to go beyond mere interpretation of the law but to give rulings in a dispute and ensure the ruling is complied with for the sanity of the society. Were the courts to merely interpret the law then by the same token we would expect parliament to merely make laws and stop there! If the majority of the back benchers are opposed to the amendment; if the majority of Kenyans want elections carried out in August 2012 as per the constitution why then should the Cabinet- just 42 Kenyans insist on changing that date? Does the Constitution of Kenya belong to the people of Kenya or does it belong to 42 cabinet ministers, the chairman of the IEBC and the Speaker of the National Assembly? Who is supreme here? The people of Kenya or the individuals employed by the people of Kenya? And what is the role of the Commission on the Implementation of the Constitution in this saga? Why is no one listening to them? Isaak Hassan must remember that the new constitution was approved through a popular vote .Therefore there is nothing wrong in making a populist decision if that is what the owners of the constitution want. Those who are incapable of respecting the constitution have no place in the present Kenya. Kenyans are tired of compromises and backroom deals. For those whose lives were formed in the crucible of the Vietnam years, including the civilian and military leadership of the Bush era, the dead, whether ours or the enemy’s, were seen as a potential minefield when it came to antiwar opposition or simply the loss of public support in the opinion polls. Admittedly, many of the so-called lessons of the Vietnam War were often based on half-truths or pure mythology, but they were no less powerful or influential for that. In the Vietnam years, the Pentagon had, for instance, been stung by the thought that images of the American dead coming home in body bags had spurred on that era’s huge antiwar movement (though, in reality, those images were rare). Nor were they likely to forget the effect of the “body count,” offered by U.S. military spokesmen in late afternoon press briefings in Saigon, the South Vietnamese capital. Among disillusioned reporters, these became known as "the Five O’clock Follies." They were supposedly accurate counts of enemy dead, but everyone knew otherwise. In a guerrilla war in which the taking of territory made next to no difference, the body count was meant as a promissory note against future success. As it became apparent that there would be no light at the end of the tunnel, however, that count began to look ever more barbaric to growing numbers of Americans. At the time of the first Gulf War, as part of a larger effort to apply the “lessons” of Vietnam, the Pentagon attempted to prevent any images of the American dead from reaching the home front. More than a decade later, top officials of George W. Bush’s administration, focused on ensuring that the invasion of Iraq would be a “cakewalk” and a triumph, consciously played an opposites game with their version of Vietnam. That included, for instance, secretly counting the enemy dead, but keeping mum about them for fear of recreating the dreaded “body count.” General Tommy Franks, who directed the invasions of both Afghanistan and Iraq, bluntly insisted, “We don’t do body counts.” But it wasn’t true, and in the end, President Bush couldn’t help himself: his frustration with disaster in Iraq led him to start complaining about being unable to mention how successful U.S. forces were in killing the enemy; finally, compulsively, he began to offer his own presidential body counts. But an irony should be noted here. There was another lesson from Vietnam which didn’t quite fit with those drawn from body bags and the body count. American troops had been treated terribly by the American public — so went the postwar tale — and particularly by the antiwar movement which reviled them as “baby killers” when they came home and regularly spat upon them. Often ignored in this mythic version of the antiwar movement is the fact that, as the 1970s began, it was being energizedby significant numbers of Vietnam vets and active duty GI’s. Nonetheless, all this was deeply believed, even by many who had been in that movement, and everyone, whatever their politics, vowed that it would never happen again. Hence, the troops, and especially the dead, were to be treated across the board and in a blanket way as “American heroes,” and elevated to almost god-like status. So, while President Bush carefully avoided making public appearances at Dover Air Force Base as the coffins were being unloaded (lest someone confuse him with Vietnam-era President Lyndon Johnson), much publicity was given to the way hemet privately and emotionally — theoretically beyond the view of the media — with the families of the dead. In a sense, whatever proscriptions were placed on imagery of the dead, the American dead were all over. For one thing, no sooner did the Bush administration shut down those images than war critics, following their own Vietnam “lessons,”began complaining about his doing so. And even if they hadn’t, every newspaper seemed to have its own “wall of heroes,” those spreads filled with tiny images of the faces of the American dead, while their names were repeatedly read in somber tones on television. Similarly, antiwar activists toured the country with displays ofempty combat boots or set up little cemeteries honoring the war dead, even while making the point that they should never have died. No less significantly, dying Americans were actually news. I mean front-page news. If American troops died in a firefight or thanks to a suicide bomber or went down in a helicopter, it was often in the headlines. Whatever else you knew, you did know that Americans were dying in the wars Washington was fighting in distant lands. Well, that was Iraq, this is Afghanistan. That was the Bush era, these are the Obama years. So, with rare exceptions, the dead rarely make much news anymore. Now, except in small towns and local communities where the news of a local death or the funeral of a dead soldier is dealt with as a major event, American deaths, often dribbling in one or two at a time, are generally acknowledged in the last paragraphs of summary war pieces buried deep inside papers (or far into the TV news). The American dead have, it seems, like the war they are now fighting, generally gone into the dustbin of news coverage. Take November in Afghanistan. You might have thought that American deaths would make headline news last month. After all, according to the websiteicausualties.org, there were 58 allied deaths in that 30-day period, 53 of them American. While those numbers are undoubtedly small if compared to, say, fatal traffic accidents, they are distinctly on the rise. Along with much other news coming out of the planet’s number one narco-state, ranging from raging corruptionto a rise in Taliban attacks, they trend terribly. 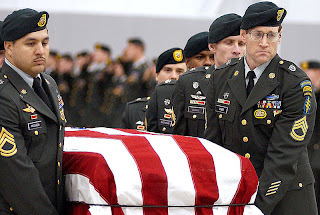 Given the modest attention focused on American deaths here in the U.S., you might almost imagine that, from the Washington elite on down, Americans preferred not to know the price being paid for a war, already in its tenth year (twentieth if you include our first Afghan War of 1980-1989); one that the Obama administration has now agreed to extend through 2014 for U.S. “combat troops” and possibly years beyond for tens of thousands of non-combat trainers and other forces who will be in no less danger. After all, in two different incidents in November, Afghans turned their weapons on Americans trainers and eight U.S. troops died. (In the past 13 months, this has happened to Western trainers six times.) These stories, too, generally haven’t made it off the inside pages of papers. In understanding how this relative lack of attention is possible, it’s worth noting that the American dead tend to come disproportionately from easy-to-ignore tough-luck regions of the country, and disproportionately as well from small town and rural America, where service in the armed forces may be more valued, but times are also rougher, unemployment rates higher, and opportunities less. In this context, consider those November dead. If you look through the minimalist announcements released by the Pentagon, as I did recently, you discover that they were almost all men in their twenties, and that none of them seem to have come from our giant metropolises. Among the hometowns of the dead, there was no Chicago, New York, Los Angeles, or Houston. There were a range of second-level cities including Flagstaff (Arizona), Rochester (New York), San Jose (California), Tallahassee (Florida), and Tucson (Arizona). For the rest, from Aroostook, Maine, to Mesquite, Texas, the hometown names the Pentagon lists, whether they represent rural areas, small towns, parts of suburbs, or modest-sized cities, read like a dirge for places you’d never have heard of if you hadn’t yourself lived in the vicinity. Here, for instance, are the hometowns of the six U.S. trainers who died in a single incident in late November when a “trusted” Afghan policeman opened fire on them. (Whether he was a Taliban infiltrator or simply a distraught and angry man remains an unanswered, possibly unanswerable, question): Athens (Ohio, pop. 21,909), Beaver Dam (Wisconsin, pop. 15,169), Mexico (Maine, pop. 2,959), Quartz Hill (California, pop. 9,890), Senoia (Georgia, pop. 3,720), Tell City (Indiana, pop. 7,845). Here, as well, are some, but hardly all, of the other hometowns of the November dead: Chesterfield (Michigan), Chittenango (New York), Conroe (Texas), Dalzell (South Carolina), Davie (Florida), Fort Smith (Arkansas), Freeman (Missouri), Frostburg (Maryland), Greenfield (Wisconsin), Greenwood (Louisiana), Mills River (North Carolina), Pago Pago (American Samoa), Sierra Vista (Arizona), Thomasville (Georgia), and Wyomissing (Pennsylvania). Back in early 2007, Demographer William O’Hare and journalist Bill Bishop, working with the University of New Hampshire’s Carsey Institute, which specializes in the overlooked rural areas of our country, crunched the numbers on the rural dead from America’s recent wars. According to their study, the death rate "for rural soldiers (24 per million adults aged 18 to 59) is 60% higher than the death rate for those soldiers from cities and suburbs (15 deaths per million)." Recently, sociologist Katherine Curtis arrived at similar conclusions in a studyusing data on U.S. troop deaths in Iraq through 2007. There’s no reason to believe that much has changed in the last three years. Keep in mind that a number of the soldiers who died in November had undoubtedly been in Afghanistan before, probably more than once, and had they lived (and stayed in the military), they would surely have been there again. The reason is simple enough: the full weight of the American war state and its seemingly eternal state of war lands squarely on the relatively modest numbers of “volunteers,” often from out of the way places, who make up the American fighting force. The New York Times’s Bob Herbert, for instance, wrote an October column about an Army Sergeant First Class who died in Afghanistan while on his 12th tour of duty (four in Iraq, eight in Afghanistan). By 2014, had he lived, he could easily have been closing in on 20 tours. As Herbert indicated, he wasn’t typical, but multiple tours of duty are now the norm. In October 2009, six months after the Pentagon rescinded its ban on coverage of the arrival of the war dead, in an obvious rebuke to his predecessor, President Obama traveled to Dover Air Base. There, inside the plane that brought the American dead home, he reportedly prayed over the coffins and was later photographed offering a salute as one of them was carried off the plane. (Eighteen were unloaded that day, including three containing dead agents from the Drug Enforcement Administration.) It was a moving ceremony and, as Byron York, columnist for the conservative Washington Times, pointed out not long after, the president wasn’t alone. Thirty-five media outlets were there to cover him. Like so much that has had to do with the Obama era, as York also noted, this particular post-Bush version of a sunshine policy didn’t last long in practice (though the president himself continues to talk about the American war dead). Now that the dead can be covered, with rare exceptions few seem to care. For those who want to keep a significant American presence in Iraq, continue our war in Afghanistan until hell freezes over, and expand the Global War on Terror (stripped of its name in the Obama years but bolstered in reality), it’s undoubtedly more convenient if the dead, like their war, remain in those shadows. In the Bush years, the dead, despite bans, seemed to be everywhere. In the Obama years, except to the wives and children, parents, relatives, friends, and neighbors they leave behind, they seem to have disappeared into the netherworld like the “shadows” we sometimes imagine them to be. In this, they have followed the war in which they fought to a premature graveyard of American inattention. Be careful what you wish for. In a war in which it costs $400 a gallon to deliver fuel to an energy-guzzling military at the end of embattled supply lines thousands of miles long, another seven or eight years to a “victory” that leaves the U.S. in control of Afghanistan (Afghanistan!) while paying for a 400,000-man strong, American-trained army and police force, might be the worst fate possible. When it came to an explanation for why we were pursuing such a war so tenaciously over decades, the president simply reiterated the usual: that our goal was never again to let that country “serve as a safe haven for terrorists who would attack the United States of America.” These days, when it comes to the “why” question (as in “Why Afghanistan?”), that’s about as much as this administration is likely to offer. It seems that explanations, too, and even the need for them have disappeared into the shadows. The president felt absolutely sure of one thing, though. He told the Americans gathered at Bagram “without hesitation that there is no division on one thing, no hesitation on one thing — and that is the uniformed support of our men and women who are serving in the armed services. Everybody, everybody is behind you, everybody back home is behind you." Behind them? Maybe. But if so, we’re talking way, way behind. Americans may support the troops to the skies, but they are taking no responsibility for the wars into which they are being endlessly recycled until, assumedly, they are used up, wounded, or killed. And by the way, don’t hold your breath for the day when some new Maya Linbegins to design an Iraq or Afghanistan Wall. For America’s small town “heroes,” it’s surge and die. A grim epitaph from Afghanistan, that proverbial graveyard of empires. Note: I first visited the subject of America’s rural and small-town dead in January 2007 in two pieces: “Surging from Kenai” and “America’s Forgotten Dead.” Last week, at his invaluable Informed Comment blog, Juan Cole, too, noted the lack of attention to American deaths in Afghanistan. (“That six U.S. soldiers were killed in one day was generally not news on the so-called news networks, though of course the major print media reported it.”) In addition, let me mention, as I do periodically, how eternally useful I find Antiwar.com (a crew who never seem to sleep) and Paul Woodward’s the War in Context weblog when it comes to keeping an eagle eye on our world of war. The number of Americans killed in action in Iraq and Afghanistan is approaching the 5,000 mark, putting new weight on President Barack Obama's exit strategy and the foreign policies of the Republican presidential candidates. As of Nov. 22, the number of Americans killed in action in both wars came to 4,984, according to the U.S. Department of Defense. That's only six people shy of the heavily symbolic 5,000-casualty mark, which will likely ignite more clashes over Pentagon spending on the two wars, the automatic defense cuts triggered by the supercommittee's failure, Obama’s plans to withdraw from Iraq by year’s end, and the president's decision to reduce troop numbers in Afghanistan. During Tuesday night’s CNN debate by the Republican candidates, Mitt Romney echoed a Republican critique of Obama's plans, saying “This is not time for America to cut and run.” But Jon M. Huntsman Jr., a former ambassador to China, called for most American troops to leave Afghanistan quickly. Huntsman and Romney exchanged some sharp words even, with Mr. Huntsman, who has staked his candidacy on doing well in the Jan. 10 New Hampshire primary, declaring at one point that "We don't need 100,000 troops." The two wars are responsible for 6,137 total deaths, including 1,333 non-hostile casualties. TheIraq war, which started in March 2003 and has lasted 3,171 days, was responsible for 4,486 casualties, and the Afghanistan war, which passed its 10-year mark this October, was responsible for 1,831. In total, there have been 47,061 Americans wounded in action in both theatres. When Joseph Kony and his fellow bandits went to the bush to wage a war against the NRM government in Uganda, it was a protracted destructive conflict that pitted Ugandans against Ugandans. But because Kony’s militia was not a conventional army, it became near impossible to dislodge them from Northern Uganda. Occasionally when the NRM fire power was too much, they would melt into the jungles of South Sudan where another civil war was in progress. This was the tactic that sustained the LRA against the Ugandan army for years. It was only after the SPLM reached a peace accord with the Khartoum regime and the war in the South Sudan subsided did the LRA move out when the government in Juba threw them out. Now, as I write this article, the LRA menace is yet to be over. It is rumored that they have moved deep into the jungles of the Congo Forest, Chad and possibly the Central African Republic where they have continued to raid villages and kidnap children for soldiers. To illustrate how the LRA is still very much alive in our region, just the other day, President Obama offered to give Uganda America’s special marines to help hunt down Kony and his fellow bandits and where possible hand them over to The Hague for trial for crimes against humanity. Whether the Americans will succeed where the Ugandan army didn’t have much luck still remains to be seen. The Americans themselves have had their fair share of fighting an unconventional army. The wars in Iraq and Afghanistan were not meant to drag on for a decade. Here was a mighty army, the only super power left on earth going to war with militias in the rough terrains of Afghanistan. Ten years later, the American might has been tested to the limit. With its warships, drones, fighter jets and ground troops, the 200,000 plus American soldiers did not overrun militia strongholds over night, in days and even in weeks. Slowly weeks turned into months, as months turned into years. As I write this article, there is no end in sight for the American soldiers in Kabul and Kandahar. Based on these observations, one can only hope that before Kenya decided to pursue the Al Shabaabs inside Somalia just like the Americans pursued the Al Qaida in Iraq and Afghanistan, the authorities planned for a long haul inside Somalia. Like their ideological bedfellows, the Al Shabaabs will hit and run for a long time. They will ambush Kenyan soldiers hit them at the most unsuspected moments. They will infiltrate Kenyan territory from time to time and carry out terrorist and suicide attacks if for nothing but for publicity. The reason they will employ these tactics is because as terrorist militias, they lack the resources such as those that are available to a regular military operation. The Al Shabaabs know that they are fighting a superior army that is also backed by many countries in the region. Whether this expressed support for Kenya from the Indian Ocean countries as well as the East African Community countries will result in military, logistical and material support is yet to be known. What is important now is that there is a lot of moral support for the Kenyan operation inside Somalia against a terrorist group that has made life unbearable for law abiding Somalis. Kenya did not invade Somalia as a country. It went there in hot pursuit to exterminate thugs that had made Kenya a playground. These thugs had become so daring that they started kidnapping and abducting Kenyans and tourists at will. It was becoming unsafe for tourists to visit Lamu and Malindi tourist resorts. Kenyan armed forces on the border towns in the North were not spared either. More scary was the realization that even Nairobi was no longer safe as local Kenyan young people had been recruited in droves, brainwashed and returned to Kenya to carry out terrorist attacks on Kenyan soil. Such attacks had increased with alarming frequencies. It was therefore just a matter of time before the Kenya government acted. And indeed it acted with measurable success. However if Kenya has to win the war, the security intelligence forces must refocus on terrorist cells already in Kenya. Some of these cell members may look very ordinary to the unsuspecting public. Others may be local people born and bred in our midst yet they have been converted into Islam, brainwashed and made to believe that they are fighting a holy war because 12 beautiful virgins are waiting for them in paradise should they die fighting a holy war. Kenya should work around the clock to persuade these local insurgents to confess, denounce the Al Shabaab and get them properly debriefed and integrated into the society. If it is poverty and joblessness that made them easy targets for the Al Shabaabs then the government must work hard to find meaningful employment for the youth of Kenya. As the military continues with operations in Somalia, the Kenyan army and the AU forces must work as a team to give support to the populations already liberated. And this is where all those countries that have supported Kenya should come in. Somalia is in dire need of schools, hospitals and food. There is no infrastructure worth talking about. The culture of gun lifestyle must be eradicated in liberated areas. Somalia needs teachers, doctors, engineers, agriculturalists and civic educators to help them start all over again. This is a task that the whole of Africa needs to be involved in. 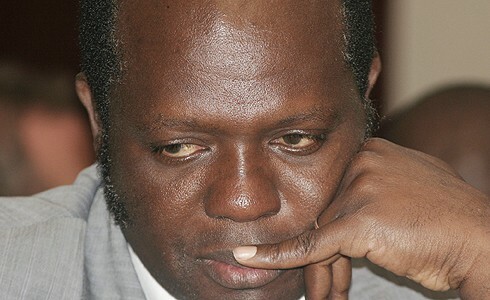 WHY IS RAPHAEL TUJU GOING BACK TO KISUMU THIS WEEKEND? My friend Raphael Tuju is indeed a presidential candidate in 2012 even though he has yet to declare his party of choice. If anything, I am one of those people who strongly believe that he has a constitutional right to vie for the highest post in the land once his credentials meet the mandatory requirements. To be a president of Kenya, I suppose one must be a Kenya citizen by birth, above 18 years of age, must possess a college degree, a morally upright citizen and law abiding with no criminal record. Other than these qualities, one must believe in the principle of good governance, the rule of law, ability to respect human rights, a sense of justice for all and be of sound mind. Tuju possesses all of the above. However, I’m beginning to get worried about Tuju’s style of launching his campaign. He has started on a combative mode many months ahead of the election season. It would appear that Tuju’s primary mission is to provoke the ODM into doing something stupid so that the electorate and especially the ODM opponents can find something to whip the party with. If I were Raphael Tuju, I would resist the temptation to take on Raila Odinga and ODM especially in Nyanza. That strategy is a non-starter. Let me state categorically that as a Kenyan, Tuju just like any presidential aspirant should be free to go anywhere in the Republic of Kenya and solicit votes. He should be in Mombasa, Nakuru, Eldoret, Nyeri, Machakos, Meru, Embu, Garissa, Moyale, Narok, Lodwar, Kapenguria, Kericho, Kisii, Kisumu, Kakamega and Mt. Elgon hunting for votes unmolested. What baffles me is why Raphael Tuju is hell bent on returning to Kisumu this weekend after the violence that he faced just the other day. As I write this article, some of the young hooligans who pelted him with stones are already charged in courts in Kisumu. When such hearings start in earnest, political temperatures will be building up in Kisumu whether we like it or not. Residents will recall that his earlier forays in Kisumu campaigns for whatever faction of government when he was a minister have always ended in chaos and even deaths of innocent people. It is my considered opinion that if Tuju wants to be president he doesn’t have to campaign in Kisumu. In fact he is better off focusing on other regions and forget Kisumu if the residents of Kisumu are hostile to him. He is better off starting with Siaya, Bondo, Busia, Kakamega, Migori, Homa Bay and Kisii as he plans for Kisumu. He may also need to scout for influential heavy weights in Kisumu to prepare the ground for him rather than adopting a bravado approach in Kisumu politics because that approach is bound to backfire very badly on him. It is my considered opinion that a presidential aspirant who makes Raila Odinga his manifesto or punching bag will never get Kenyans’ votes. This country has moved on. Kenyans truly need thinkers for president- those who can think outside the box. Politics of bringing down opponents, politics of character assassinations, and politics of disparaging opponents are these days boring to Kenyans. I don’t want Tuju to go the route of ODM rebel MPs who have spent the better part of the 10th parliament making Raila their political agenda every day of the week for four years yet today they have nothing to show for it. It would be a pity if Tuju fell in the traps of KKK Alliance, the G7 Alliance and the ODM rebels. 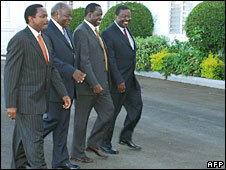 For four years they have preached the anti-Raila sermon with no converts to show for their efforts four years later. And as they shouted their voices horse, they continued to trail in the polls! We have other presidential aspirants such as Martha Karua, Peter Kenneth, Mutava Musyimi and even George Saitoti and Moses Wetangula who have declared their interests in the presidency. They have remained civil. They are not causing commotion in their backyards. If Raphael Tuju really cares for Kisumu and Nyanza people, he has no business going to that town in the knowledge that there may be riots. Kisumu has suffered enough since 1969. Young people have died senseless deaths related to politics since then, in most cases being shot dead by government security agents guarding government officials. They died under Jomo Kenyatta in 1969. They died in 2005 during the referendum campaign. They died in 2008 during the post election violence. We must say enough is enough. As a friend I must tell Raphael Tuju the truth. Do not be misled by wrong advisors who have found in you a hero to deal with Raila Odinga this time round. They are leading you in a ditch and once you fall, they will melt away. At your age you have a good chance of being a major player in politics in the next several years. Do not throw that chance away by being dragged into cheap village politics. Go to Nyanza people. Start with Rarieda and ask them to tell you where you went wrong; why they hate you so much. Nyanza people are very political but also very reasonable and forgiving. Initiate positive dialogue and they will listen to you. Choose your advisors well but listen to your inner voice. It is your best advisor. In politics individual ego can be disastrous. On the other hand humility can be very rewarding. WASHINGTON (AP) — Herman Cain is defending himself anew and — without evidence — blaming presidential rival Rick Perry's campaign of being behind the disclosure of years-old sexual harassment allegations against him. Cain is pressing forward, even as a third woman says she considered filing a complaint against him over sexually suggestive remarks and gestures. "That is the DC culture: Guilty until proven innocent," Cain told Ginni Thomas, the wife of Supreme Court Justice Clarence Thomas, in an interview published Thursday on The Daily Caller website. As the allegations rocked his campaign for the fourth day, the Georgia businessman's team intensified its claim that Perry's advisers or allies were the source of the initial story — in Politico — on Sunday night. It disclosed that the National Restaurant Association had reached financial settlements with two former employees who complained the Cain had engaged in sexually inappropriate behavior while head of the trade group in the 1990s. Perry, himself, denied that he and his campaign were involved in anyway. "We found out about the allegations against Mr. Cain the same time everybody else did," Perry told the Red State blog. A Perry aide suggested that Mitt Romney's campaign was behind it, asserting ties between Romney's campaign backers, Cain and the trade group without providing evidence of any involvement. The former Massachusetts governor's campaign said it had nothing to do with the disclosures. "I don't know what's true and what's not," Republican National Committee Chairman Reince Priebus told NBC's "Today." "I'm not going to get in the middle it. We're not the Sherlock Holmes of the presidential primary field." "I'm not the referee," he added. "Primaries are tough." In a statement Thursday, Politico's editor-in-chief John Harris said: "POLITICO, like other news organizations, can't be in the practice of confirming or denying who is or isn't a confidential source for our stories. The story we published has now been corroborated by a multitude of sources and other news organizations as accurate." The finger-pointing came as Cain fought to contain the fallout of the allegations that were made public just two months before the leadoff Iowa caucuses and with polls showing him near the top of the pack national and in early voting states. The allegations — and Cain's shifting answers to questions about them since they were first disclosed — threaten to undermine a campaign that many establishment Republicans long have viewed as a long-shot to win the party's presidential nomination. Conservatives have rallied around him, arguing — without any proof of liberal involvement — that the left was castigating Cain much as it did Thomas, also a black conservative, during his confirmation hearings in the early 1990s. Cain has repeatedly denied that he sexually harassed anyone. Beyond that, he's offered a series of conflicting explanations. After initially saying he knew of no settlements, he has acknowledged that he knew of one agreement between the restaurant association and a woman who accused him of sexual harassment. He also has acknowledged knowing of the woman's accusations against him, saying he stepped close to her to make a reference to her height and told her she was the same height as his wife. On Thursday, Joel P. Bennett — the lawyer for one of Cain's accusers — was seeking approval from the trade group for his client to issue a statement about her position, notwithstanding the confidentiality agreement she had signed as a part of the settlement. A person close to the situation, who spoke on the condition of anonymity because of the sensitivity of the accusations, said the woman was increasingly reluctant to speak publicly and said the fact that the incident has become public was very unsettling to her. The latest allegations come from a woman who said in interviews with The Associated Press that Cain was aggressive and inappropriate with her, even extending a private invitation to his corporate apartment when she worked with him at the National Restaurant Association. The woman said Cain's behavior occurred at the same time two co-workers had settled separate harassment complaints against him while he was leading the association. Cain's third accuser was located and approached by the AP as part of its investigation into harassment complaints against Cain that were disclosed in recent days and have thrown his presidential campaign into turmoil. She spoke only on condition of anonymity, saying she feared losing her current job and the possibility of damage to her reputation. The woman said she did not file a formal complaint against Cain because she began having fewer interactions with him. Later, she learned that a co-worker — one of the two women whose accusations have rocked Cain's campaign — already had done so. She said she would have felt she had to file otherwise. She said Cain told her that he had confided to colleagues how attractive she was and invited her to his corporate apartment outside work. His actions "were inappropriate, and it made me feel uncomfortable," the woman said. The AP confirmed that the employee worked at the restaurant association with Cain during his time there, that she has no party affiliation in her voter registration in the past decade and that she is not identified as a donor in federal campaigns or local political campaigns. Records show she was registered as a Democrat at one point previously. Separately, Chris Wilson, a pollster who did work for the restaurant association during Cain's tenure, said in an interview that he witnessed the businessman making inappropriate comments and gestures toward a young woman who worked for the group during a dinner at a hotel in Arlington, Va., in the late 1990s. Wilson declined to discuss more specifics without the woman's permission, but said it was not one of the two women who settled complaints against Cain and it was not the third woman interviewed by the AP. Cain's behavior with women was well known, Wilson said. "I'm surprised that it hasn't come up before," said Wilson, whose firm, Wilson Perkins Allen Opinion Research, does polling for a political action committee backing Perry. Wilson said he has not been the source of information on the accusations against Cain. Asked for comment about the accusations, including the most recent, Cain spokesman J.D. Gordon said, "Mr. Cain has said over the past two days at public events that we could see other baseless allegations made against him as this appalling smear campaign continues." Gordon added, "He has never acted in the way alleged by inside-the-Beltway media, and his distinguished record over 40 years spent climbing the corporate ladder speaks for itself." And with that, Cain and his campaign started pointing the finger at Perry. In an interview with Forbes on Wednesday, Cain said he believed a Perry consultant gave information about the allegations to Politico. After denying earlier this week that he knew about any settlements, Cain said he had outlined the allegations of a woman to the consultant, Curt Anderson, when Anderson was helping him on an earlier campaign. He told his supporters by phone: "We now know and have been able to trace it back to the Perry campaign that stirred this up, in order to discredit me and slow us down." Perry's campaign called that "reckless and false." And Anderson told CNN on Thursday that he never had a conversation with Cain about sexual harassment. "It's just not true," Cain said. Asked in an interview whether he believed Cain was lying in his statement to Forbes magazine, Anderson said, "I'm not here to add any more name-calling." Associated Press writers Kasie Hunt, Brett J. Blackledge and Mark Sherman in Washington, writer Beth DeFalco in Trenton, N.J., and news researcher Judy Ausuebel in New York contributed to this report.